the waves would reach Grenada within just a few minutes. the northern coast of Venezuela to the south and the Leeward Islands and Puerto Rico within an hour and a half. Petrocaribe is an oil alliance of many Caribbean states with Venezuela to purchase oil on conditions of preferential payment. The alliance was launched on 29 June 2005 in Puerto La Cruz, Venezuela. 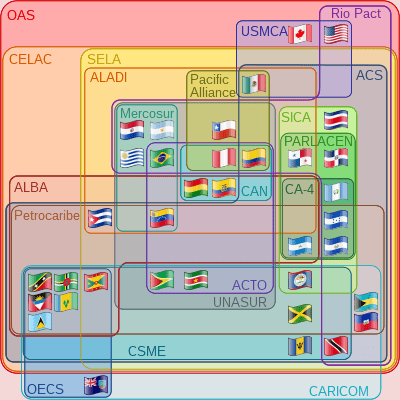 In 2013 Petrocaribe agreed links with the Bolivarian Alliance for the Americas (ALBA), to go beyond oil and promote economic cooperation. There are a total of 17 members, plus Venezuela; 12 of the members are from the 15 member CARICOM (excluding,Barbados, Montserrat and Trinidad and Tobago). At the first summit, 14 countries joined the alliance. These were:Antigua and Barbuda, the Bahamas, Belize, Cuba, Dominica, Dominican Republic, Grenada, Guyana, Jamaica, St Lucia, St Kitts and Nevis, Saint Vincent and the Grenadines, Suriname and Venezuela. 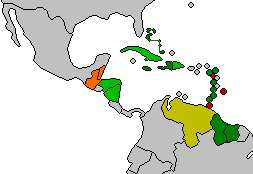 At the third summit, Haití and Nicaragua joined the union. Guatemala joined in July 2008 but left the organization in November 2013 stating that Venezuela had not provided them with the ultra-low financing rates that they had been promised. Haiti had not been initially invited to the talks, since Venezuela did not recognize its then post-Jean-Bertrand Aristide government. The country finally joined the alliance in April 2006, once the newly elected president René Préval took office. Honduras became the 17th member of the alliance in December 2007, under President Manuel Zelaya but left the organization after the 2009 coup d’état and later rejoined it on May 2012. Belize set up the Belize Petroleum Energy Company to coordinate for the project. Barbados denied that it had succumbed to pressure from the United States, who had a strained relationship with Venezuela, as the reason, but has not ruled out agreeing to Petrocaribe in the future. On August 31, 2005, Energy Minister Anthony Wood said that they are weighing options over signing Petrocaribe. In April 2011 Hugo Chávez renewed his offer for Barbados to join PetroCaribe. Panama applied for membership on March 3, 2009 and initially said it would continue to join PetroCaribe under the new president, but Panama remains a non-member. The first summit, which launched the project was held in Puerto La Cruz, Venezuela. The second summit of Petrocaribe was held in Montego Bay, Jamaica. The third summit was held in Caracas, Venezuela and the fourth summit was held in Cienfuegos, Cuba in December 2007. Seventh summit was held in Caracas, at 6 April 2013. Honduras membership was revived after suspension because of coup in 2009 and Guatemala became official new member of Petrocaribe. Summit also propose deeper cooperation between Petrocaribe states and states of ALBA on basis of new economic zone. Summit had discussion also about tourism, air traffic and food security.The 11th Summit was hosted by Haiti in Port-au-Prince by the invitation of the Martelly/Lamothe administration, this was the first Petrocaribe Summit after the death of former Venezuelan President Hugo Chávez who started the Petrocaribe economic initiative after his death from cancer related illnesses. The Venezuelan delegation included his successor President Maduro who agrees to continue the programs of former President Hugo Chávez.